Do you have chronic fatigue, joint pain, or muscle aches? Have you mapped out every public bathroom due to IBS-related diarrhea? Do you experience constipation, bloating, or gas? Are your sinuses always bothering you? Do you have post-nasal drip? Are your medications simply masking your symptoms? 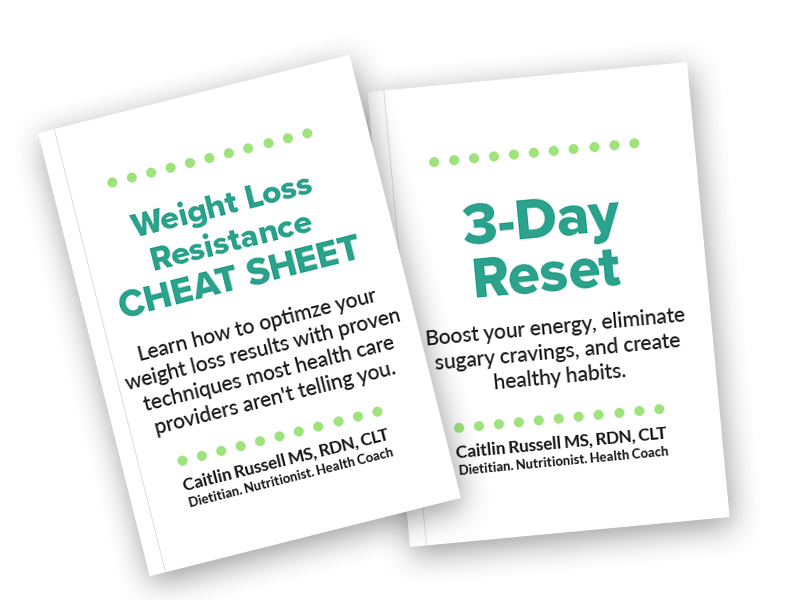 If we haven’t met, I am Caitlin Russell, Registered Dietitian Nutritionist, Certified LEAP Therapist, Holistic Health Coach, and founder of Russell Nutrition. I help people just like you, who have suffered for years from various chronic conditions, find symptom relief simply by figuring out to which foods they are sensitive. Inflammation is the root cause of many chronic diseases. There are several reasons why we develop inflammation but diet plays a big role in our body’s inflammatory response. Research has shown that food and food additives like food coloring can be involved in a wide array of chronic health problems. When we eat a food that causes inflammatory mediators to be released from our cells, this can lead to many negative symptoms such as irritable bowel syndrome (IBS), migraines, and fibromyalgia. Mediators include histamines, cytokines, leukotrienes, and prostaglandins. Mediators that get released are the key event that leads to every negative effect that you suffer. These mediators create inflammation and leave you feeling AWFUL! When your immune system reacts to something you eat, symptoms may be delayed for up to 72 – 96 hours. You may eat something that you think is fine because you don’t notice an immediate reaction. However, reacting to something on Thursday that you ate on Monday will make it hard to pinpoint the problematic food. You can react to “healthy foods” like rice, salmon, apples, turmeric, or cinnamon! Without food sensitivity testing, it’s like trying to play pin-the-tail-on-the-donkey while blindfolded. It will take a long time to figure out what actually causes your symptoms. Testing takes the blindfold off and gives you personalized information that can greatly reduce or even eliminate your chronic symptoms. Allergies and sensitivities are different. Most conditions like IBS, migraines, and fibromyalgia are not caused by an allergic reaction. It takes a different type of test, not an allergy test, to determine food sensitivities. Allergy testing measures type I, IgE-mediated immune response. Food sensitivity testing measures type III and IV, non-IgE-mediated response. While it’s important to know about any life-threatening IgE allergies you may have, it’s also important to know what’s causing sub-clinical inflammation that leads to water retention, fatigue, insomnia, arthritis, diarrhea, and so much more. The testing that I do is the patented Mediator Release Test (MRT®). It is more accurate than other tests because MRT measures ALL the mediators that could be released due to an over-active immune response to a food or food chemical. Other tests only look for antibodies and not the mediators that do the actual damage to your body and cause the inflammation. You may have a delayed, hypersensitivity reaction to a food and other tests won’t measure that either. The best part is that MRT® testing not only tells you which foods you are most reactive to, it also tells you your BEST foods. These foods will form the basis of your personalized eating plan. With MRT®, you get information that you don’t get with other tests. With my expertise and guidance, I’ll customize your food sensitivity testing results to ensure the best outcomes in the shortest amount of time. 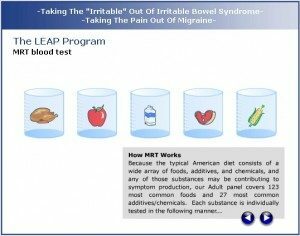 The Lifestyle Eating and Performance (LEAP) therapy plan by Oxford Biomedical Technologies is customized to your MRT results. You’ll receive a personalized protocol that combines your test results with my skills as a LEAP therapist so that you have a specific, anti-inflammatory diet designed to lower inflammation and reduce your symptoms. The MRT test measures your immune reaction to 170 foods and food chemicals. Based on your test results, you’ll know which foods are safest for you to eat – ones that don’t produce inflammation. Most clients experience significant improvement in their symptoms in the first 10 days on the program. Symptoms then continue to improve for the next 4 – 6 weeks. How closely you follow your LEAP program. Following the protocol we develop for you will help you achieve the best results. How long you’ve had your symptoms and condition(s). Damage due to inadequate nutrition, harsh medications, or chronic inflammation may take longer to reverse in some cases. The degree to which food sensitivity plays a role in your condition. Other factors such as vitamin D status, B12 deficiency, and certain bacteria can contribute to symptoms as well. Below is a sample of test results. You will receive a 65+ page report that contains many tips on getting started, how to follow the LEAP program, and forms for tracking your symptoms. We’ll cover all of this in the initial consultation after your MRT test is done. Accessible no matter where you are located in the U.S.
All consultations with me (pre-qualification, initial, and follow-ups) are conducted via phone so you don’t have to worry about traffic or finding a parking space. You can even have your consultations in your pajamas! ? Sign up below for a brief, pre-qualification call to determine if you’re a good candidate for MRT testing and LEAP. Caitlin can answer any and all questions you have about food sensitivity testing. You will get your blood drawn using the MRT test kit that is sent to you. Blood gets shipped overnight to Oxford Biomedical Laboratories using a prepaid FedEx envelope that comes with the kit. Receive your personalized results a few days later. Schedule the initial phone consultation with Caitlin to go over your results and create a phase 1 eating plan that is 100% customized to you. Phase 1 lasts up to two weeks. 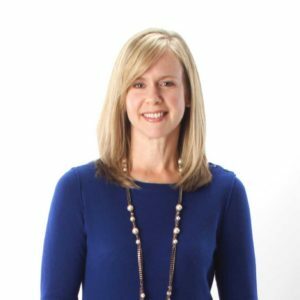 Schedule follow-up phone consultations with Caitlin to discuss changes to your eating plan as you progress through your personalized protocol. Phases 2-6 slowly incorporate more foods and we create a healthy eating plan that works best for your lifestyle. Sign up to see if you’re a good candidate! During the pre-qualification call, we will discuss MRT test and LEAP program pricing. Below, simply click if you’d like to chat by phone or video. Answer a simple questionnaire and click “Next.” All information is kept strictly confidential. You will receive an email confirmation with details for your pre-qualification session. I will call you on the day and time you requested at the number you provided. Insurance: Upon request, you will receive an invoice with billing information for you to submit to your insurance provider for possible reimbursement. Reimbursement amounts depend on your insurance company. It’s time to stop procrastinating and put your health first! LEAP has helped thousands of patients across the country turn years of suffering into a bright, happy, healthy future, free of the symptoms that once seemed an inescapable part of life. Are you ready to discover what foods may be contributing to your unwanted health challenges? Ready to sign up for testing? If you’ve spoken with Caitlin in a complimentary, pre-qualification session (see above) and you’re ready to get started with food sensitivity testing, here’s what to do. Complete the information below and submit payment. You will receive a medical history form to complete online. Caitlin will be in touch with you to discuss scheduling your first session. This includes the test kit that is mailed to you, your test results, information, initial consultation with Caitlin, follow-up consultations, and email access to Caitlin in between sessions. LEAP Diet on Dr Oz – helps Tausha Moore (An oligoantigenic diet + working with Certified LEAP Therapist) April 10, 2014, Toledo Blade Newspaper by Natalie Trusson Cafarello. Alternative approach to IBS and migraine is winning over providers. Dis Manag Advis. 2004 Jan;10(1):6-10, 1. 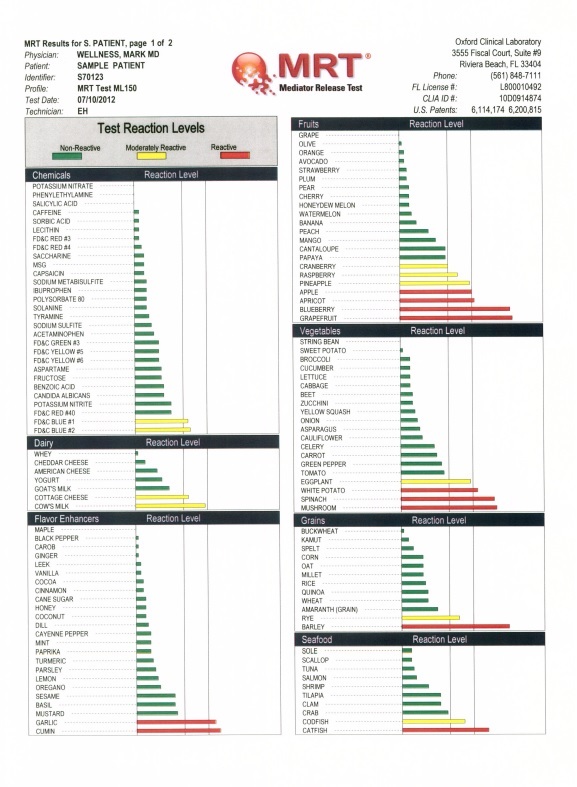 Mediator Release Test (MRT®) – Principles & Method; Non-IgE mediated food hypersensitivity can follow both Type 3 and Type 4 pathways…why not use a test that identifies both? Oxford Biomedical Technologies’ prestigious medical advisory board serves pro bono and has made major contributions to the fields of allergy, immunology, gastroenterology, and adverse food reactions. The Patented Mediator Release Test (MRT): A Comprehensive Blood Test for Inflammation Caused by Food and Food-Chemical Sensitivities; by Mark J. Pasula, PhD; Townsend Letter; January 2014. Bueno L, Fioramonti J. Effects of inflammatory mediators on gut sensitivity. Can J Gastroenterol. 1999 Mar;13 Suppl A:42A-46A. Munno I et al. Cytokines and migraine: increase of IL-5 and IL-4 plasma levels. Headache. 1998 Jun;38(6):465-7. Shah U, Walker WA. Pathophysiology of intestinal food allergy. Adv Pediatr. 2002;49:299-316. Smythies L et al. Human intestinal macrophages display profound inflammatory anergy despite avid phagocytic and bacteriocidal activity. J Clin Invest. 2005 Jan;115(1):66-75. “Evidence Based Practice uses the best available evidence, the results of peer-reviewed scientific studies, whenever possible, and, when the science is lacking, expert opinion and experience.” JADA. Mar 2005. “Evidence-based dietetics practice is based on the best available evidence including research, national guidelines, policies, consensus statements, expert opinion and quality improvement data. Evidence-based dietetics practice involves continuing evaluation of outcomes which becomes part of the evidence base.” Academy of Nutrition and Dietetics.